MissMarzenia plays life. : Couch Surfing craze! Last year my brother picked up Couch Surfing. His first visitors were two bikers from The Netherlands. It was an awesome experience and I thought to myself why not do that now that we live in a nice city and have a spare couch. So I invited two couples who wanted to come over to Stockholm. Gosia and Adri are experienced travelers (you can see their website HERE). They arrived on Wednesday and wanted to walk around the city straight away. They were very lucky with the weather, it was sunny and hot all day long! We walked around City and all around Gamla Stan. We walked slowly and had a lot of time to talk about traveling, our experiences and Stockholm itself. 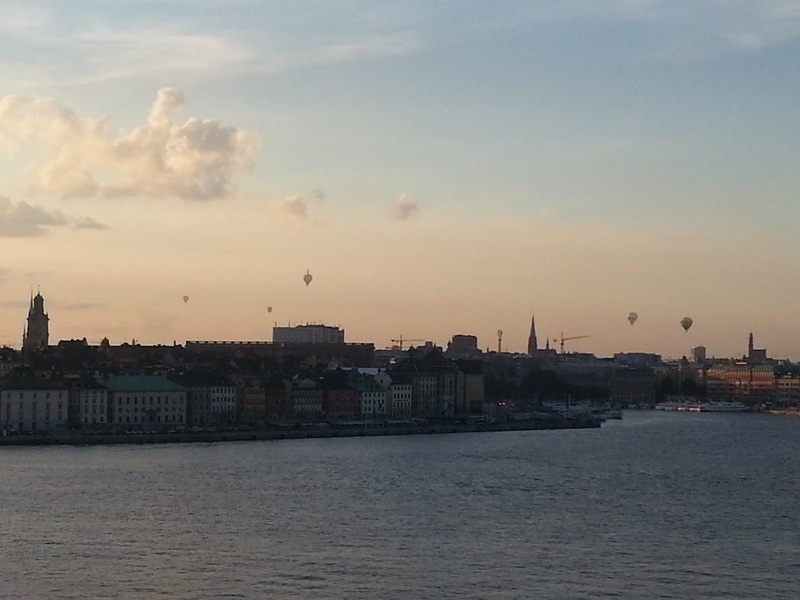 We passed Slussen and ended up at northern shore of Sodermalm, since there is a beautiful view there. As you can see there is a balloon flying up there... And then suddenly the sky was filled up with them! We were just standing there for a while... One of the balloons was shaped like a hand! We chilled out at home in the evening, talking over rice salad I made for them (and I am so happy they likes it so much, they asked me to do it again next day :) It was an awesome day and I was happy I could enjoy Stockholm with someone. Change of guards at the Royal Palace. I want this silly camera, it is awesome! Change of guards at the entrance to the Royal Palace. Worth seeing! Narrow street right off the Vasterlanggatan. We took a Art in the Metro tour at 3 pm from T-Centralen. We were very lucky as it was the last tour in English for this year. If you are interested, the tours are still up but only in Swedish. Tour is free of charge, you just need a valid metro ticket or Access Card. I wont tell you a lot about this tour, cause I am planing to take a tour for myself looking for art in the metro in Stockholm. All I'll say is: IT WAS AWESOME! We came back to the flat, to chill out a bit, cause it was a long long day. We had some food and went out when it got dark to see how Stockholm looks at night. It was pretty but I was a little bit disappointed. I expected more more lights! After that we went to the other side of the Sodermalm, just to walk along the shore. Gosia was a little bit tired so we sat down and Adri went for a walk. We had some more rice salad and went to beds! We said our good byes in the morning. They were amazing couple and I hope all my Couch Surfing experiences are going to be like that one! Kurcze, nawet nie wiedziałem że jesteś moim rodakiem. I... związana z moim sobowtórem? wow..
i'm wondering if you are interested in hosting 2 girls from germany in november. Were are 2 stundents (Sara 26 and Maria 24) from cologne in germany, visiting stockholm after our exams in november from the 9th till the 12th. I found your blog, while i was looking for couchsurfing hosts in stockholm, and like it very much.